Roy Sea at International Yacht Collection tells me there's been a $450,000 price drop on Burger's 26.21m motor yacht Encore V.
Built in 1986, she's a rare model in the 86' Burger series with her high flared bow, formal dining room, on-deck powder room and walk-around side decks. 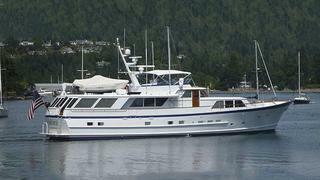 The aft-deck is 5.5m long, enclosed and air-conditioned with opening side and rear windows. The joinery work on the main deck is light colored honey teak of the highest quality. The pilothouse sole is teak with maple inlay. The master stateroom is located aft and the 2 guest staterooms are located amidship. The aft staterooms are predominantly white with light wall coverings all with ensuite heads. An estate sale, Encore V is now asking $1.1 million.